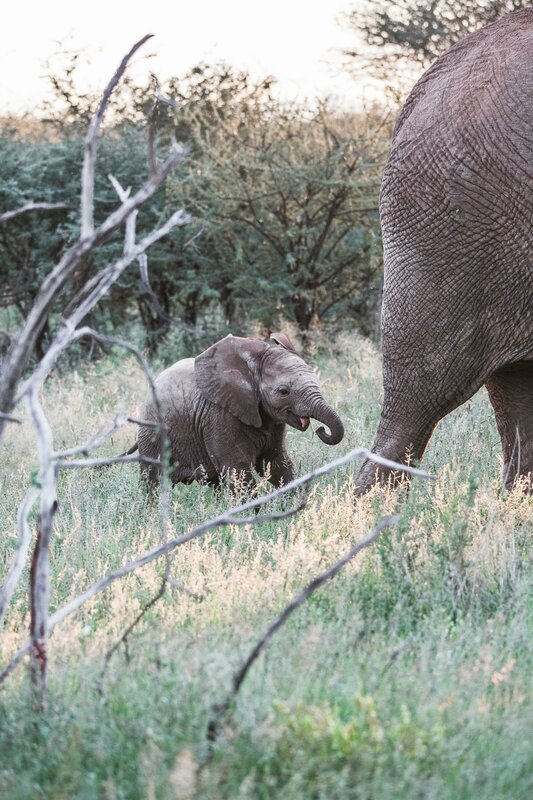 This baby is just weeks old – and imitating it’s Mom all the time! 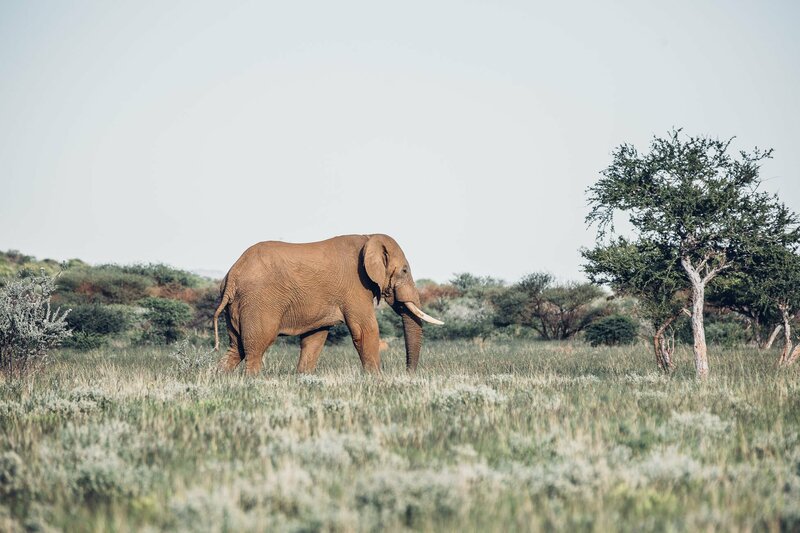 There’s no way to describe the exhilarating feeling when a herd of elephants slowly and very silently passes by right in front of your very eyes. We are at a loss for words. We even forget to take photos for a couple of minutes. 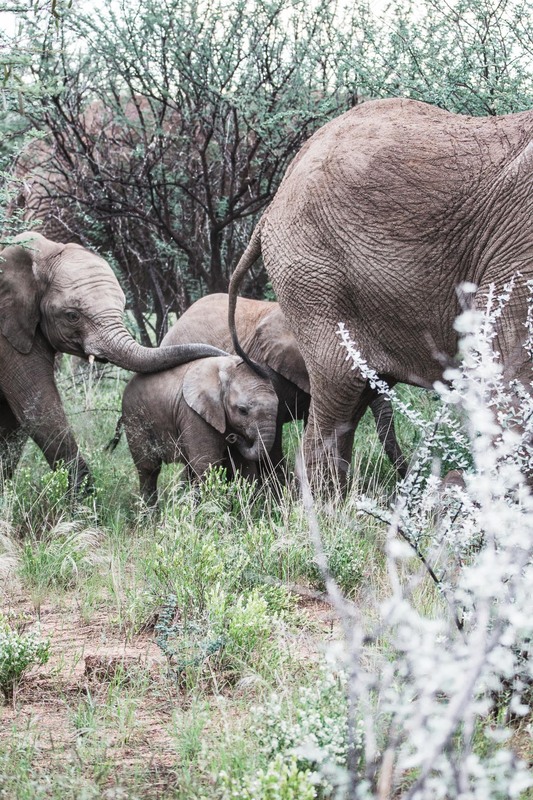 At least 30 elephants cross our path right in the middle of the Namibian bush – the older ones protecting the small ones with their trunks. 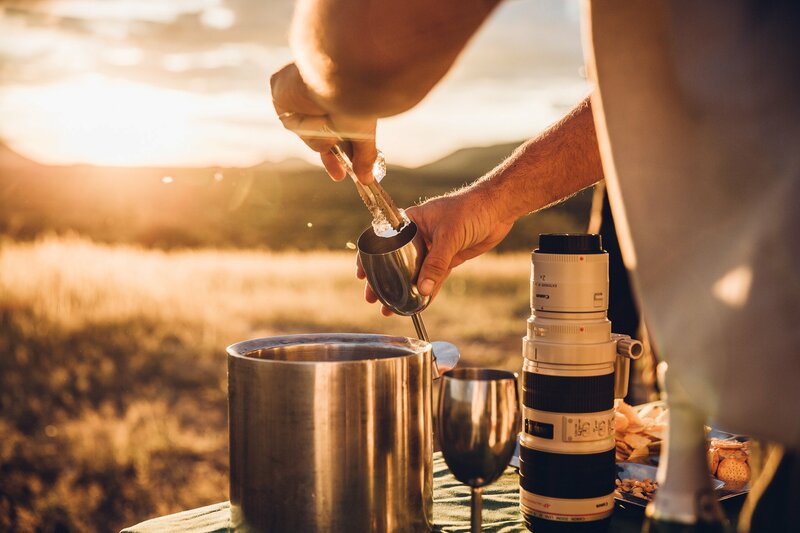 It’s a sight that becomes a memory for a lifetime, a raw encounter with nature in it’s very original and basic state – unstaged and unexpected. 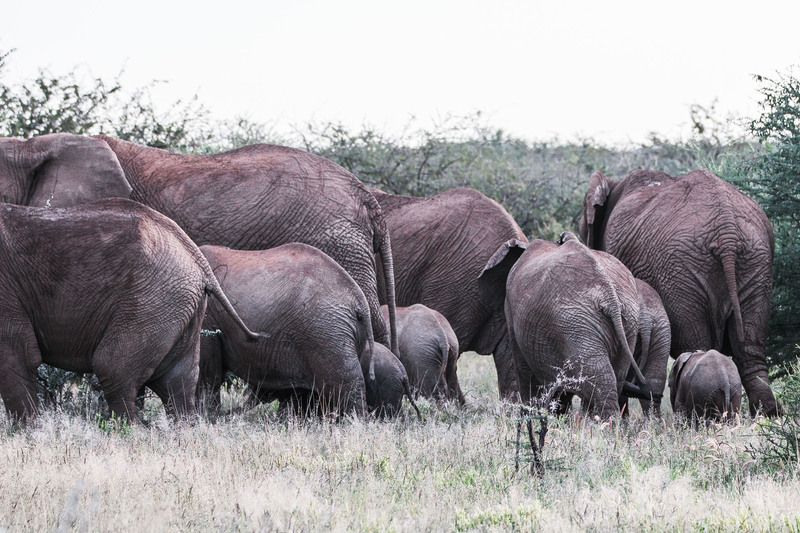 Elephants stick together in herds, that are led by a matriarch! 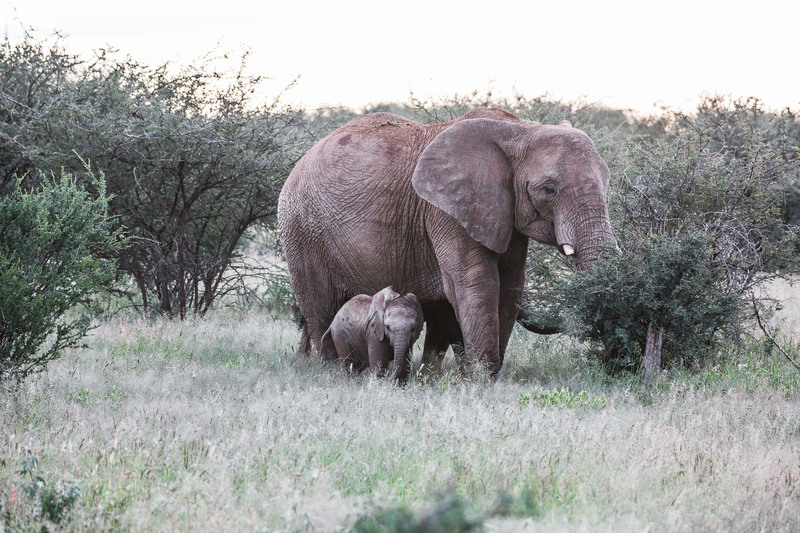 They roam the bushes together – always protecting the little ones. 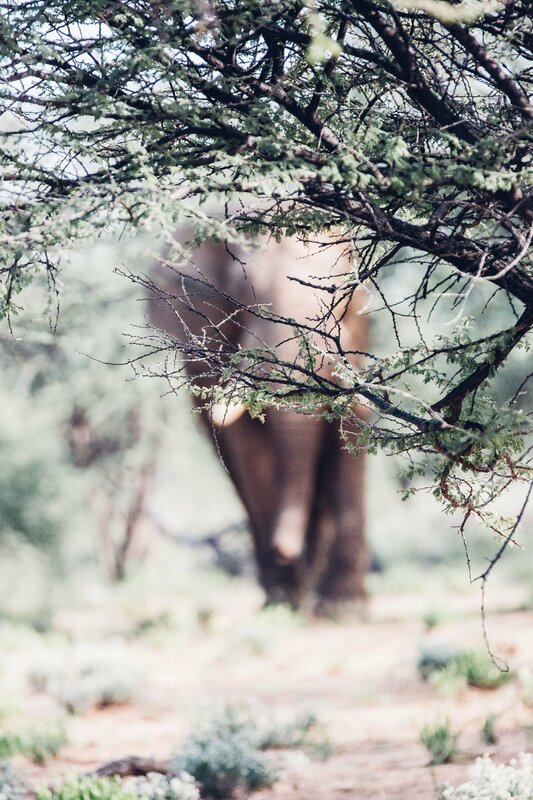 Elephants are incredibly gentle – you can almost overhear and overlook them in the thorough thicket, that is the Namibian bush in April. Yes, April. Not the most common season for a Namibia trip (yet). 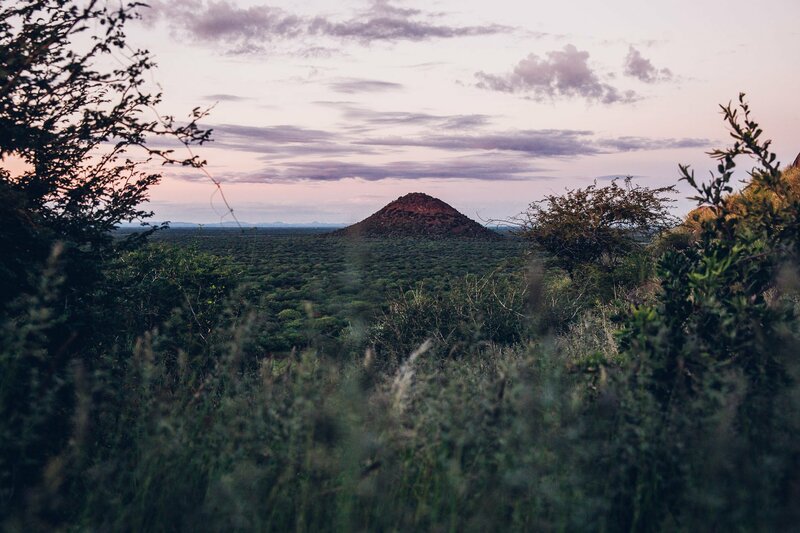 After a couple of months of rainy season everything is lush and green here in the Northern parts of Namibia. It’s the season, where the animals have enough water and are harder to spot, but it’s no less rewarding! 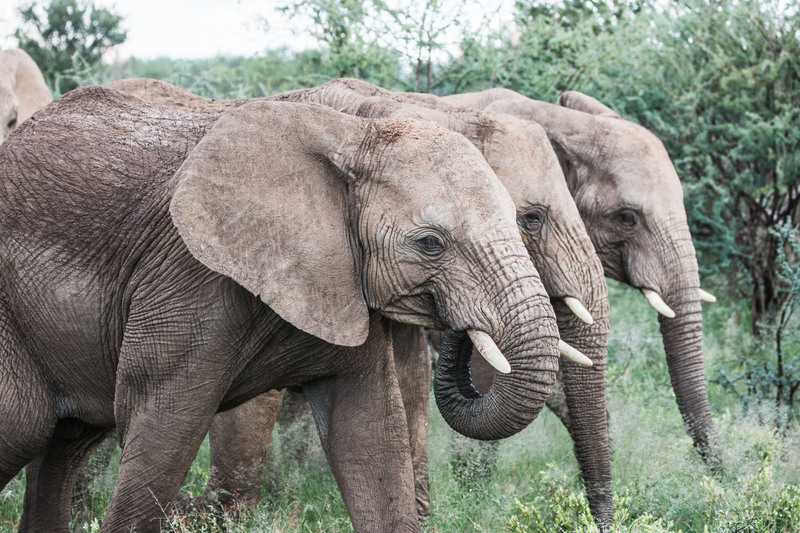 Only when the elephants leave the thicket, they are easy to spot. 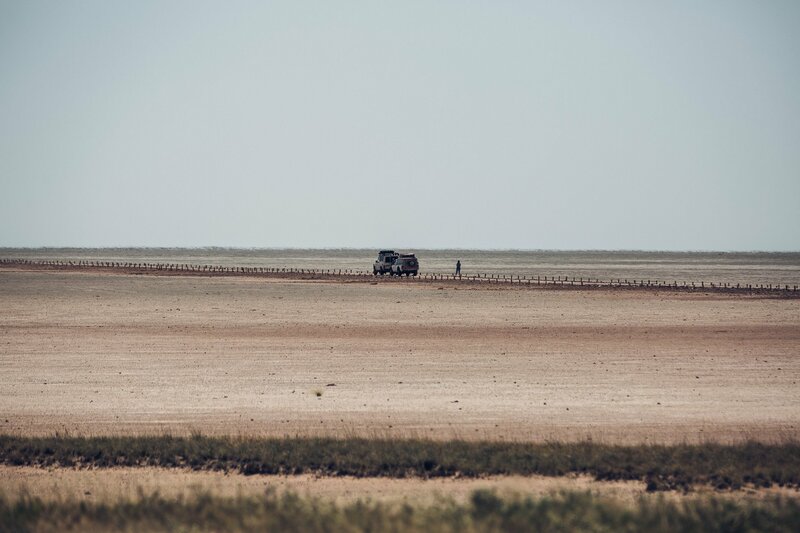 April ist not really the most recommended season when it comes to traveling Namibia. The best season for visitors starts in May, when fall arrives, the temperatures drop and the rain stops. 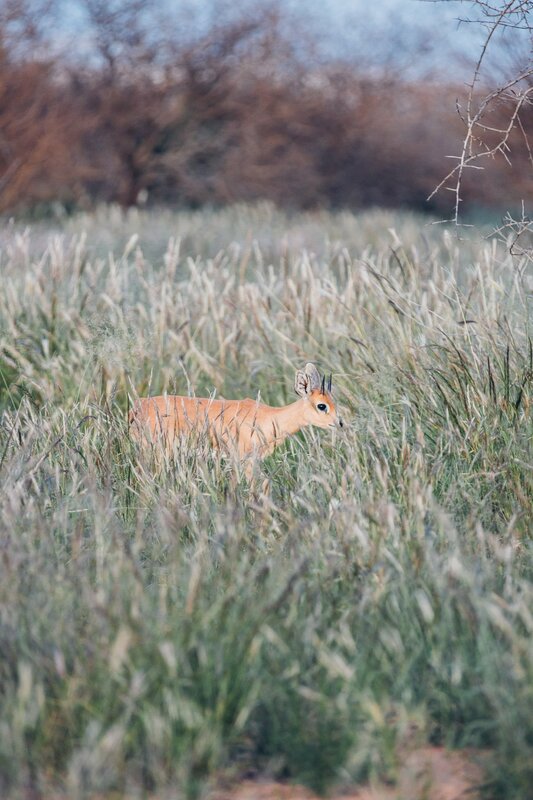 With every month that passes the green landscapes will be transformed into a yellow-brownish wasteland – making it easier to spot wildlife, which assembles at the scarce water holes. 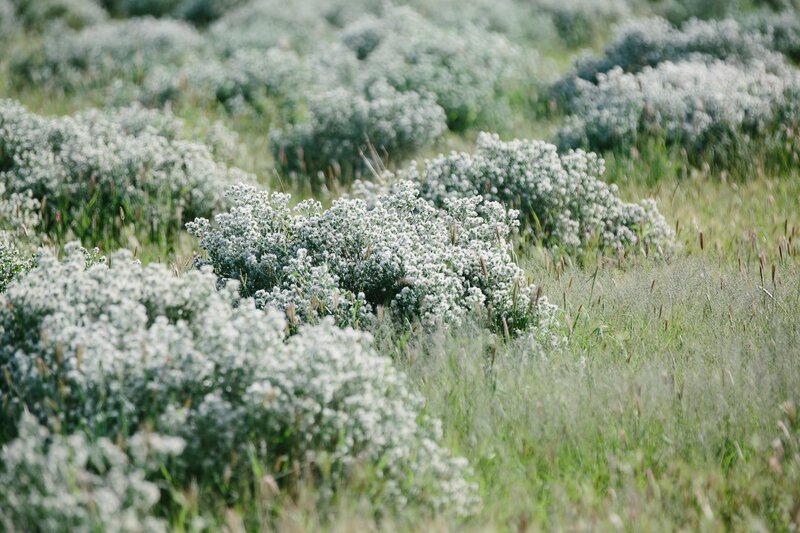 The abundance of grass and flowers is the perfect condition for herbivores like antelopes and zebras. But we chose April anyways. Why? It’s the end of the rainy season, so chances are low for rain. 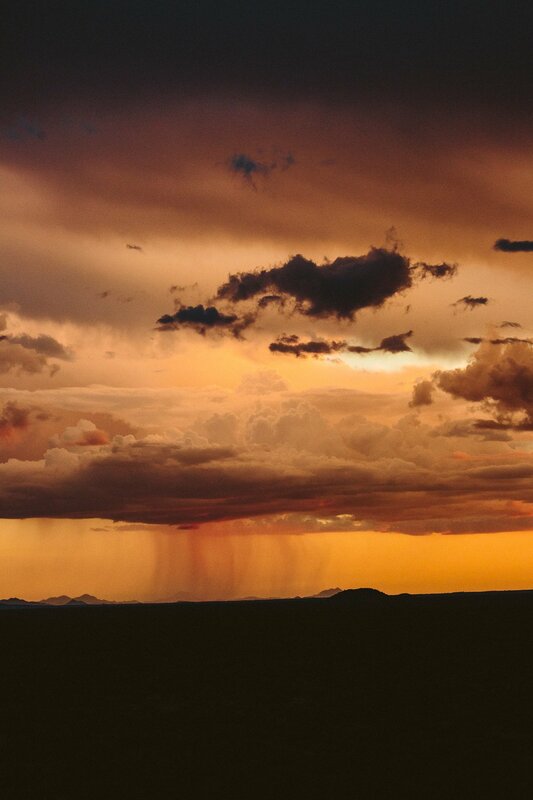 During our three weeks in Namibia we saw rain three times, but never longer than a couple of hours (and mostly at night). And more importantly: April is still low season. This makes it easier to find hotels and lodges without pre-booking everything. We wanted some freedom and liberty to change our route once in a while. This turned out to be a good idea, as we changed our plans quite a lot during this trip! 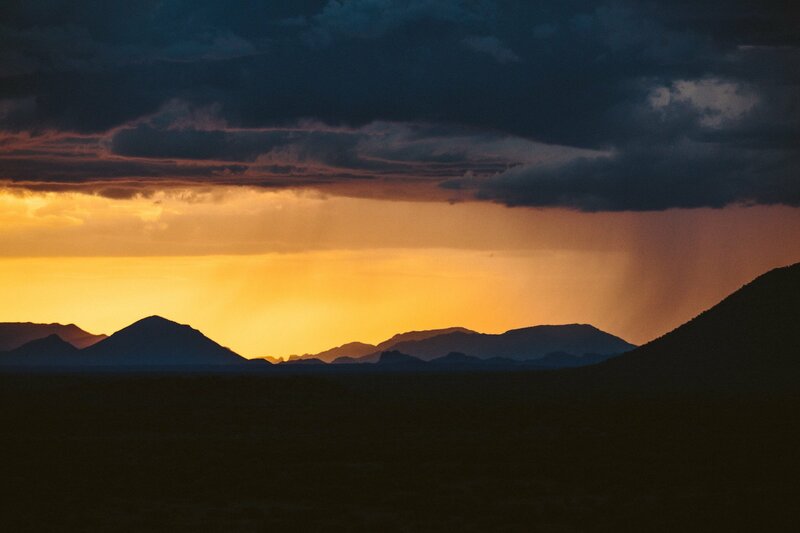 Late April rain showers hit us only once during our Safari, but they make for amazing sunsets! 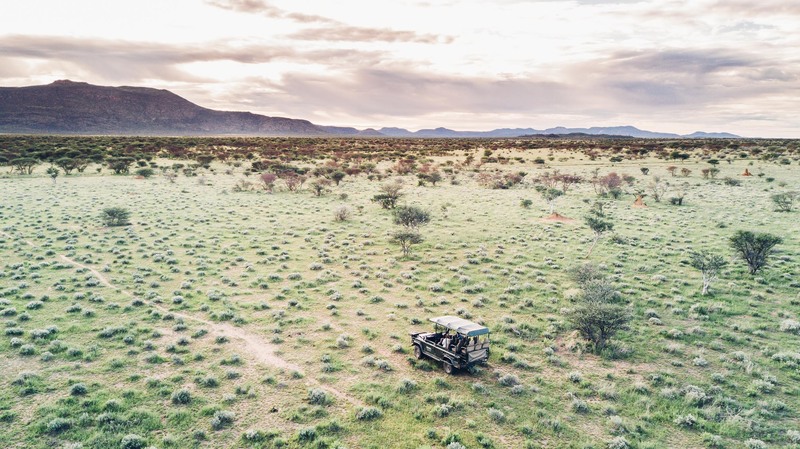 We definitely want to go back to Namibia one day in September or October to see how the landscapes change and how the wildlife adapts to the harsher conditions. Everything that’s green here will be yellow and brown by the end of the dry season! 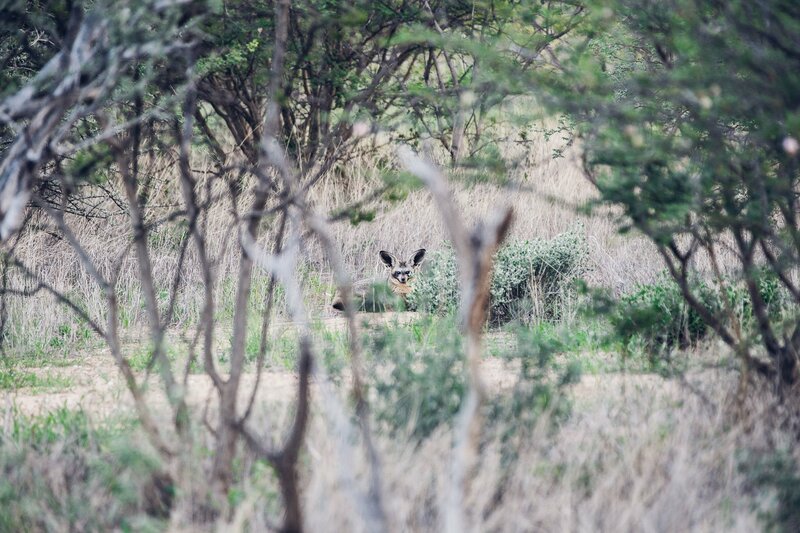 What kind of wildlife can you see during a Safari in Namibia? 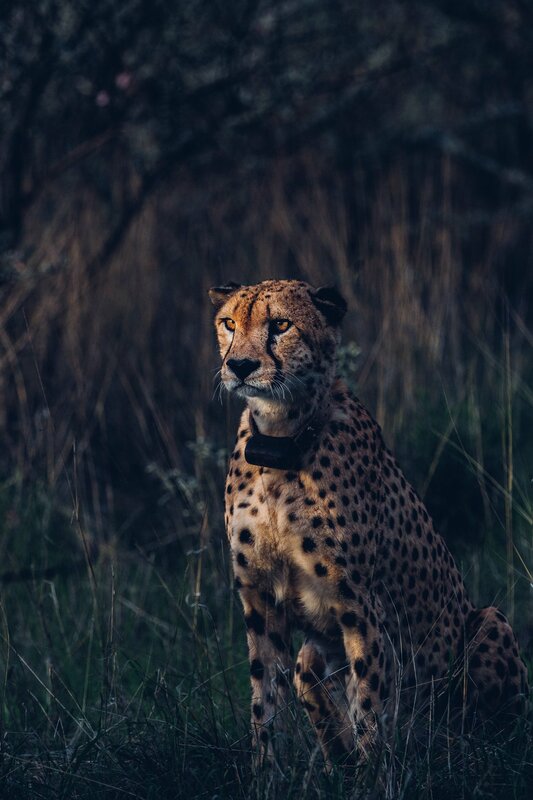 There’s the ones that are easy to spot (giraffes, zebras, oryx, kudu, steenbok, springbok, wildebeest, hippos, crocodiles, hyenas, impalas) and then the more elusive types of animals (lions, cheetahs, leopards, eland, wild dogs, rhinos, elephants). 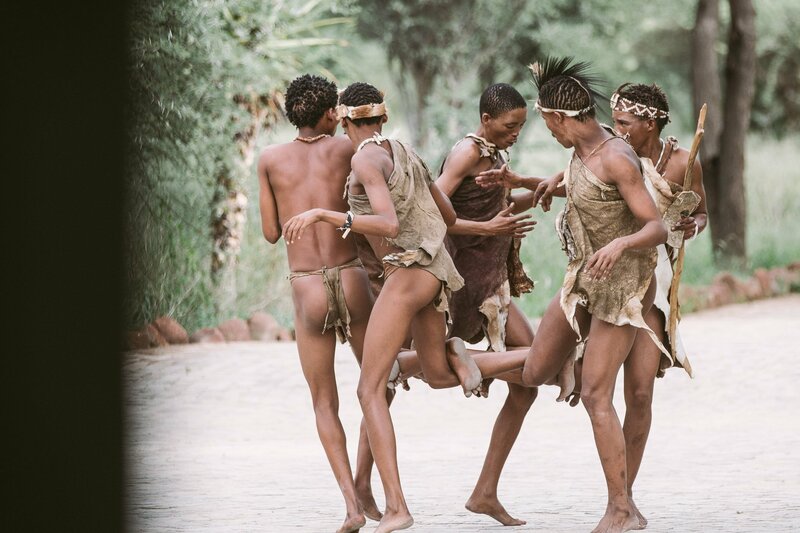 But guess what: We saw all of the before mentioned during our week-long Safari in Namibia. 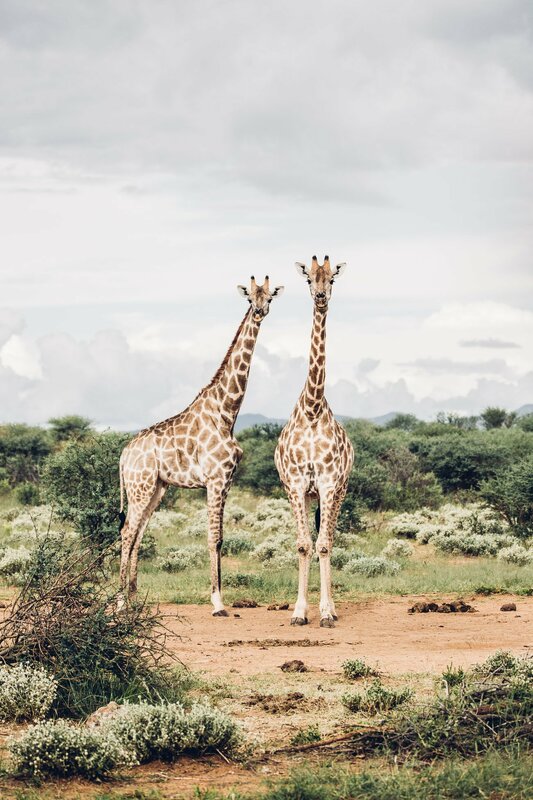 We chose to spend this week at Erindi Private Game Reserve, which is famous for it’s abundance of wildlife (read all about our verdict of the eco-lodge here). 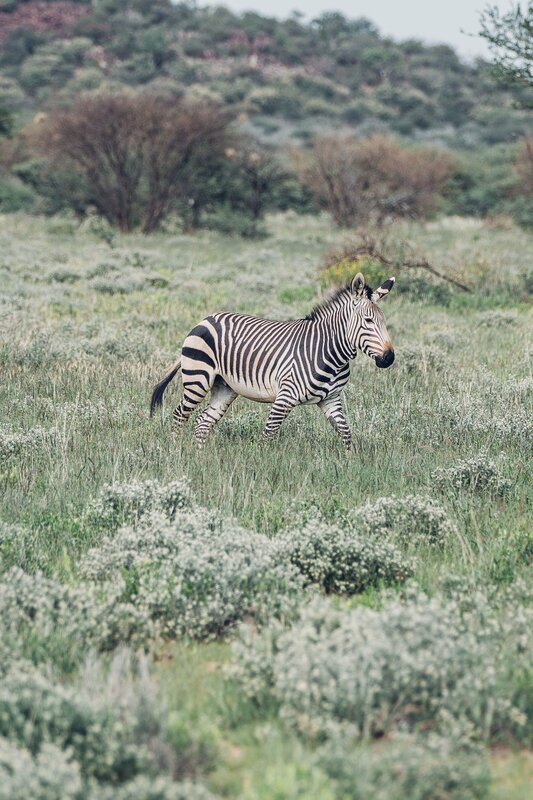 From Giraffes and Oryx to Zebras, Baboons and Impalas. 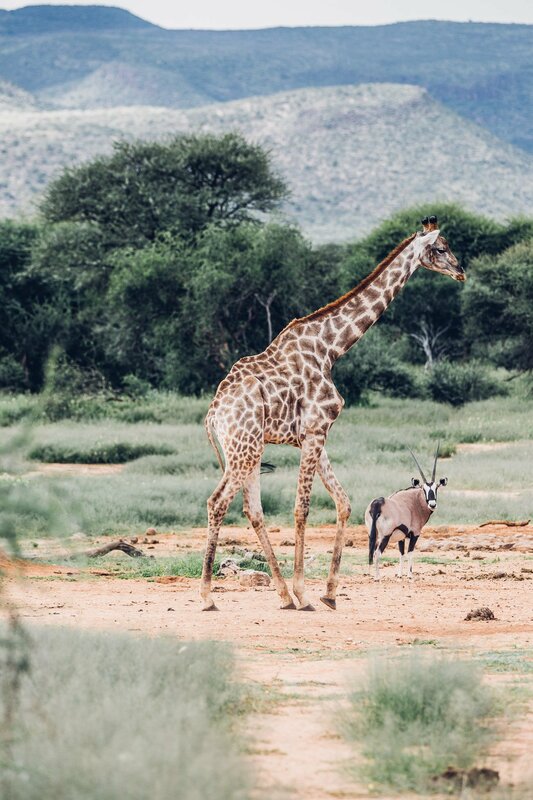 Animals can be seen in abundance during a Safari in Namibia! The only animal we didn’t get to spot is the pangolin – the most elusive of them all. 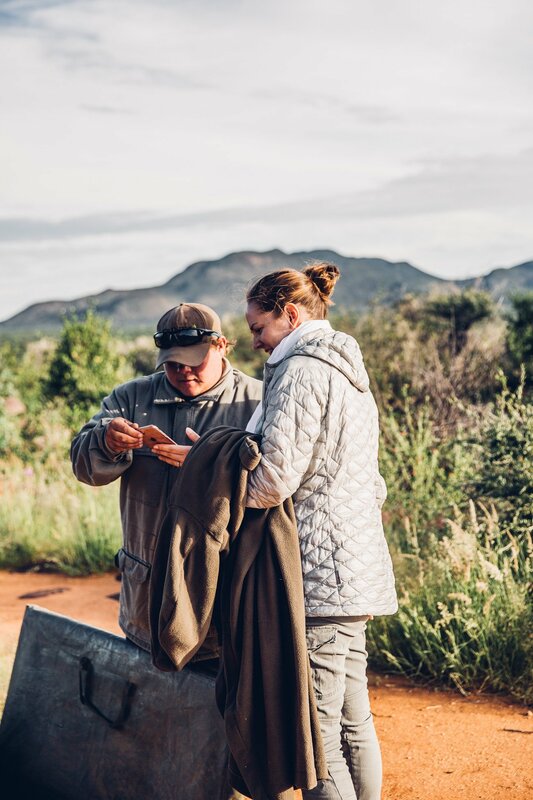 Every day the guides at Erindi write their wildlife encounters on a huge chalkboard, and the pangolin was seen by other groups multiple times during our week there. So we just didn’t get lucky. But instead we had two very rare encounters. 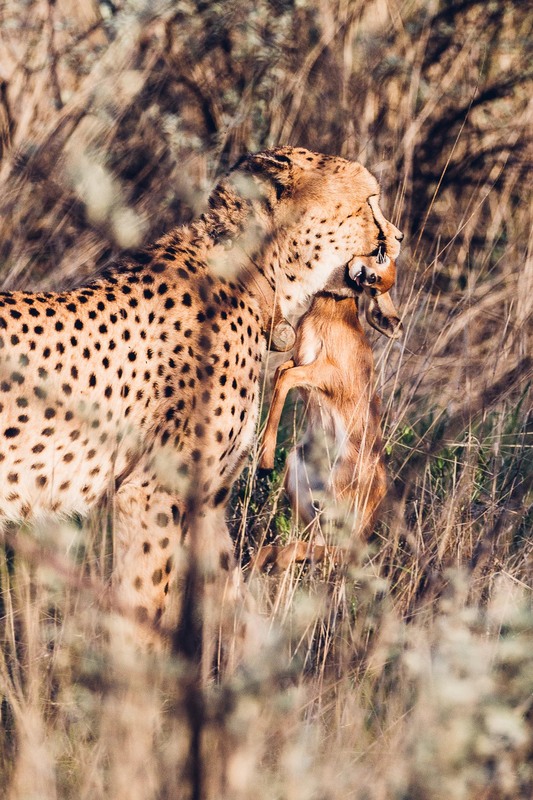 We saw a cheetah up close with a fresh kill (yes, that sounds irritating and it really is quite gut-wrenching – especially when you hear the cry of the baby first) and we even had a meet-up with a leopard! If even just for a few seconds, before he disappeared into the bushes again. 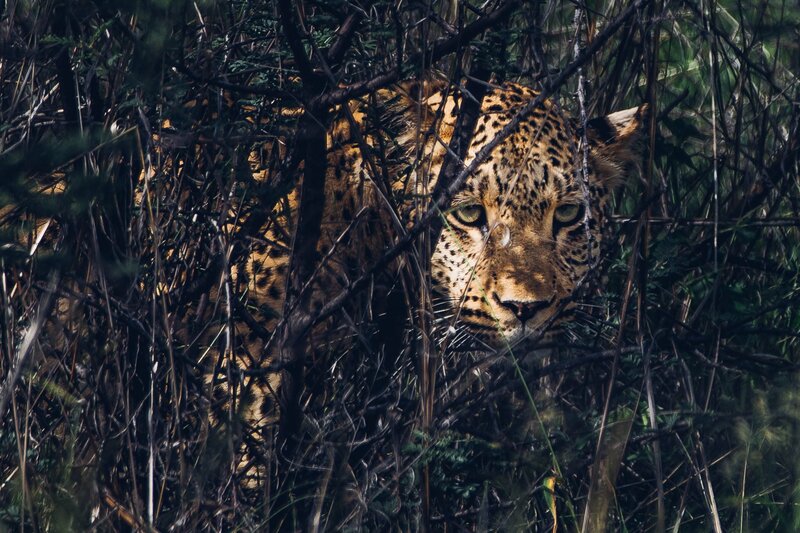 Our most amazing cat encounters – from a cheetah with prey to an elusive leopard! If you want to complete the famous Safari Big 5 (lion, leopard, rhino, elephant, buffalo) you have to be a little patient. In Erindi they don’t have African buffalos (yet, they are planning on introducing some to complete their conservation efforts). So the buffalo is missing from our “list”. Here he is: The king of the jungle. But in all honesty, we don’t care about collecting animals on a list (then we might as well become trophy hunters). We rather enjoyed spending time with wildlife on a daily basis. 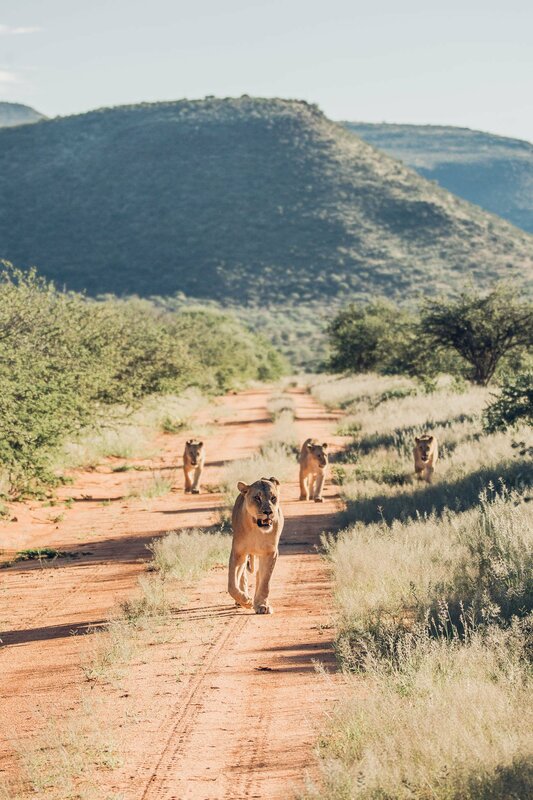 We didn’t care about visiting the same group of lions twice in a row, because it was just incredible to follow their daily routine. 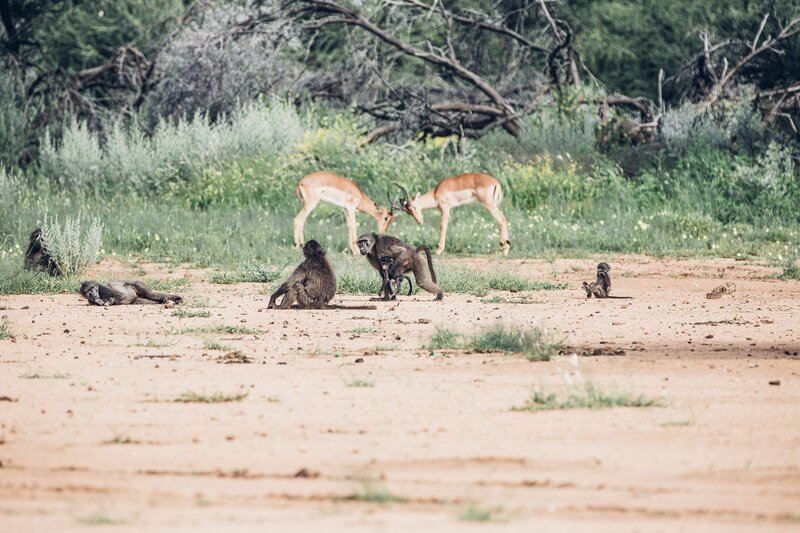 On day one we watched the mother and three cubs range the plains on their search for food. We even watched the gorgeous lioness making an attempt at killing a wildebeest (unsuccessful though). 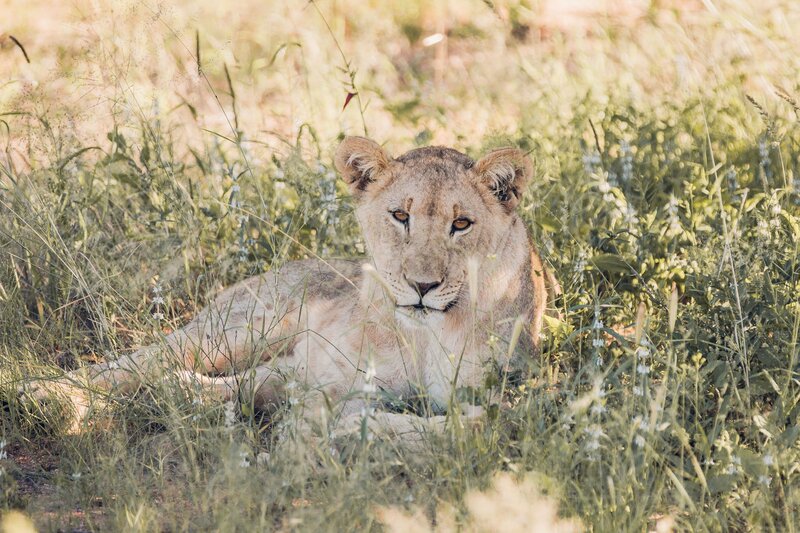 This lioness just had her second litter of three male cubs. They are about one year old, but still too young to hunt their own food. We returned to find them a day later sitting in the shadow of a tree with a fresh wildebeest kill. Mom had been successful in feeding her babies. (We’re sparing you a photo of the dead animal – just in case you’re vegetarians, like us 😉 ). 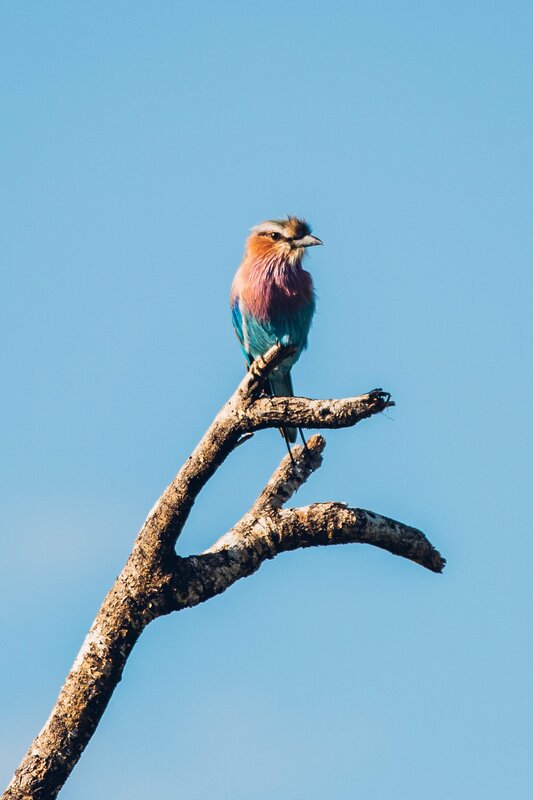 During our days in Erindi we noticed that most visitors had limited time for their successful Safari. Most of them only spent one or two nights in the lodge and tried to see everything in a short period. 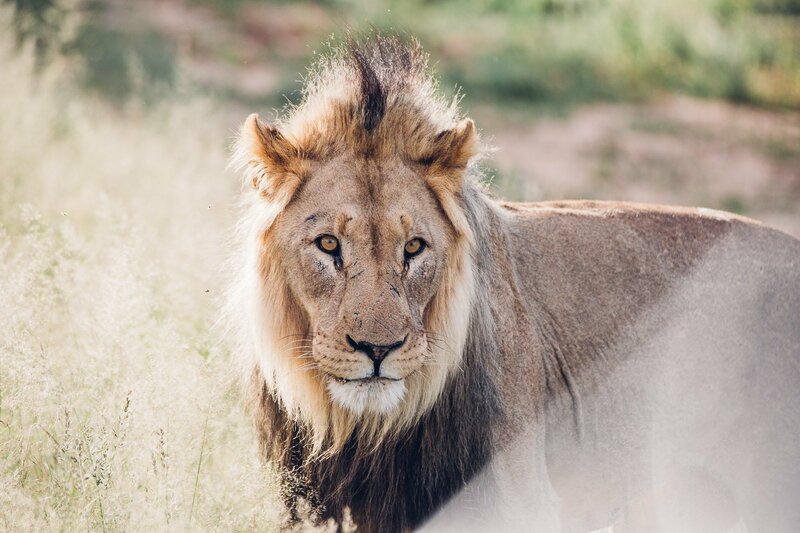 This puts quite some pressure on the guides, which have to find lions, leopards, elephants and so on – all during one or two game drives. And it also limits the time, that can be spent with the animals. 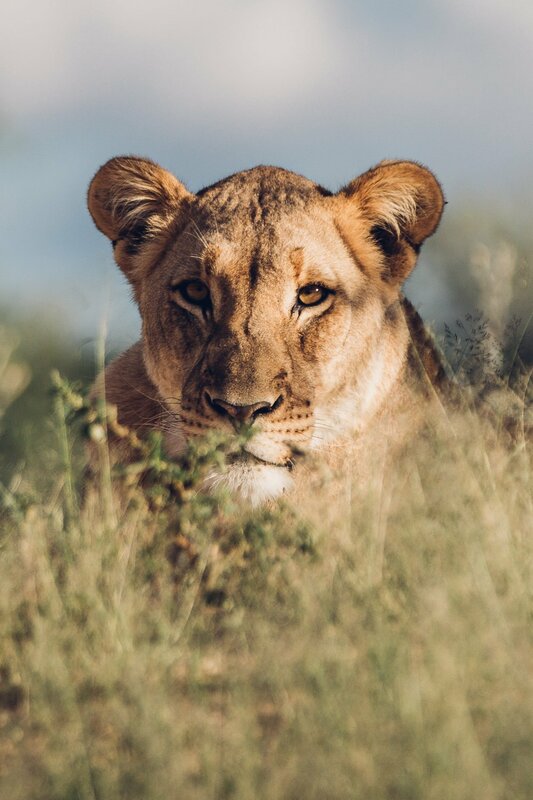 Our most precious moments on Safari in Namibia were the hours we just spent with a herd of elephants or a flock of lions. 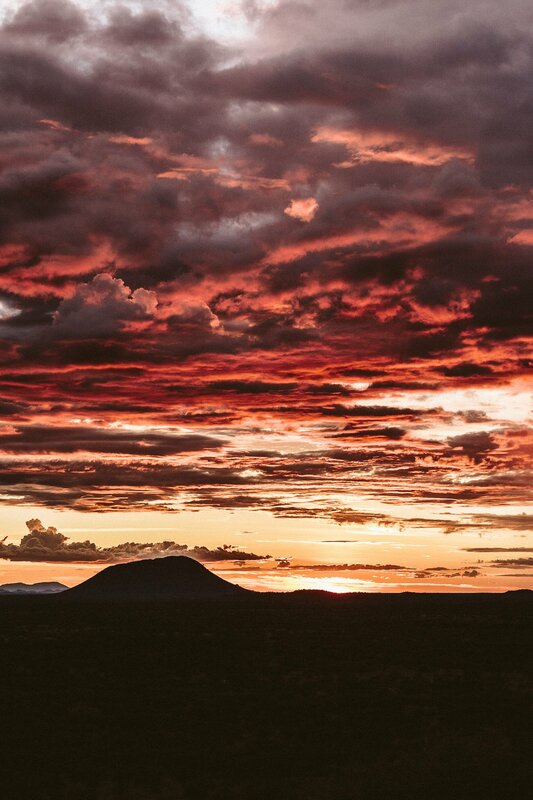 So we highly recommend planning at least 4-5 days for a Safari in Namibia! Top to bottom: Baboon, Waterbuck, Mountain Zebras. 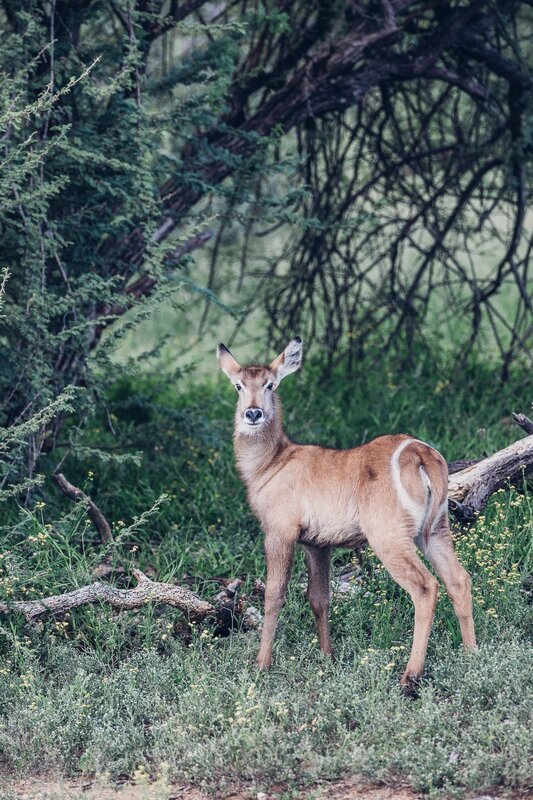 With more time during a Safari you can also focus on animals, that aren’t on top of everyone’s list. 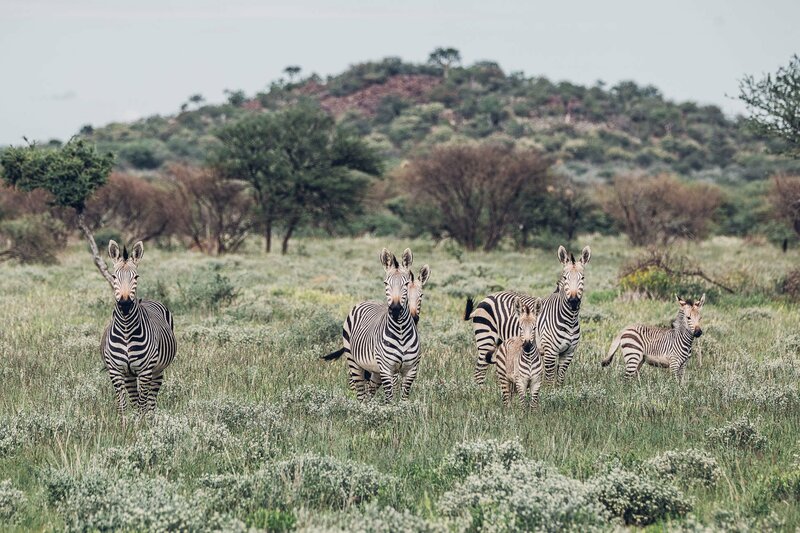 Like the hilarious baboons (it’s a real comedy watching them), waterbucks (guess how their name is connected to a toilet seat…) or the two different kinds of Zebras, that you can encounter in Namibia. Top to bottom: Lilac-breasted roller, ted-billed spurfowl, endangered African wild dogs. 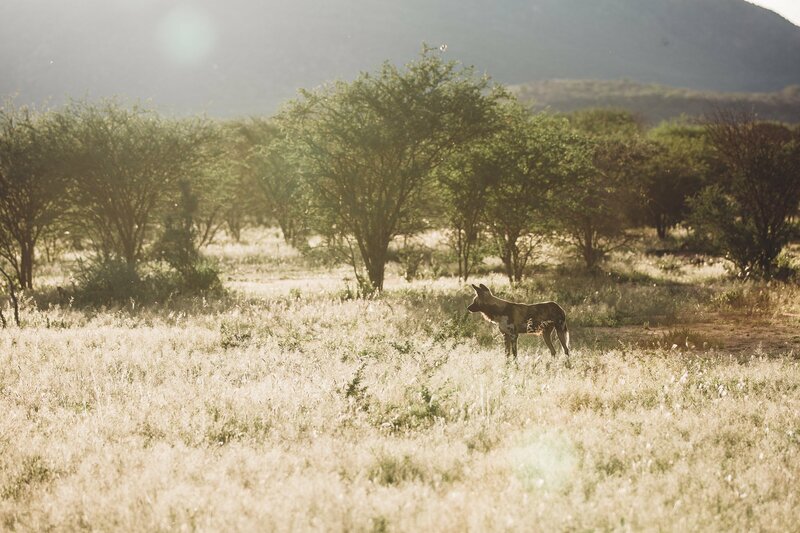 In our week at the Private Game Reserve we had enough time to learn about the abundance of birds in Namibia, but also about the incredible African wild dogs. 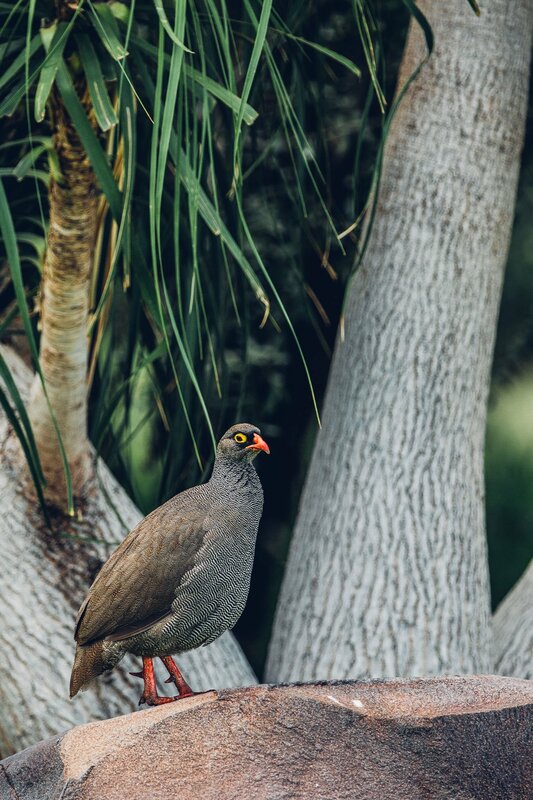 Often overlooked this species is even more threatened by extinction than cheetahs and leopards. 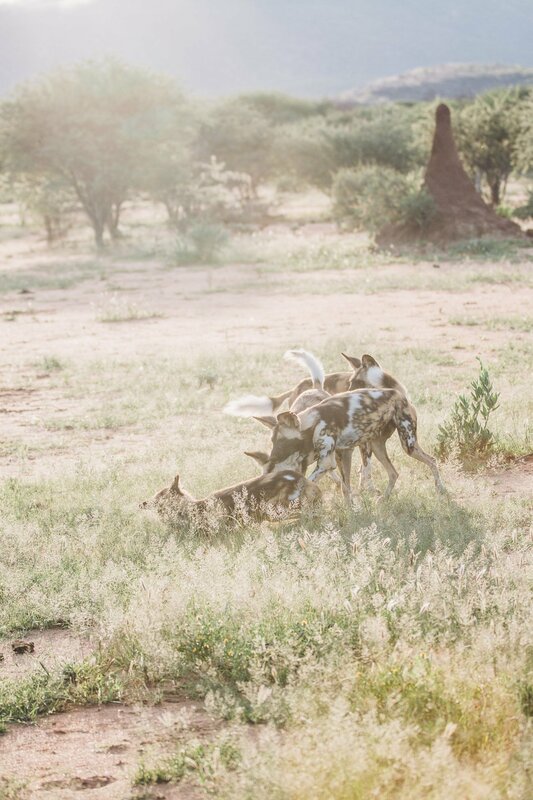 The current population at Erindi is at 12 dogs, but there was just a new litter – so it might increase slowly but steadily! 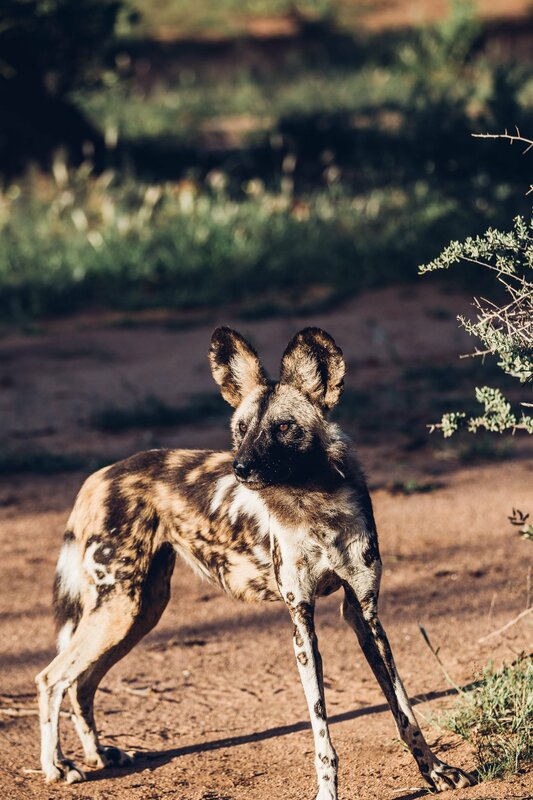 In total there’s only around 6.000 wild dogs believed to still exist worldwide, which makes them fall into the category “endangered” according to the IUCN Red List of Threatened Species. 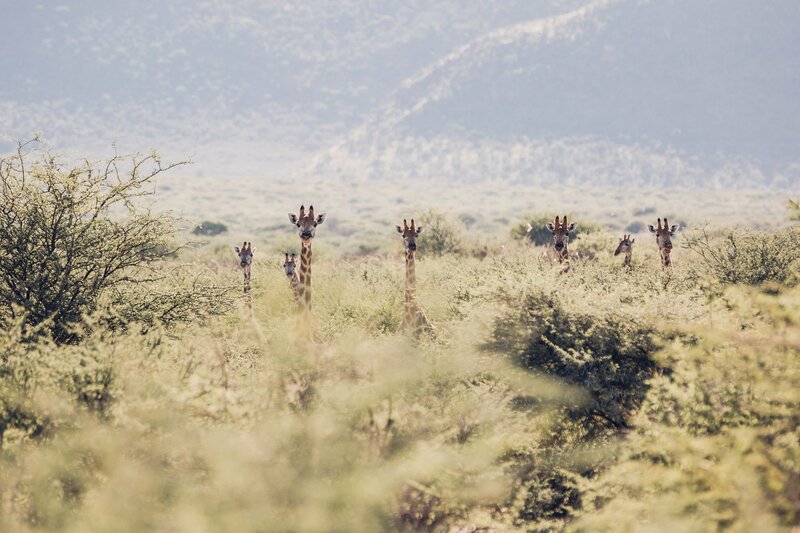 We definitely plan to return for another Safari in Namibia soon! During our trip to Namibia we tested both ways to explore the wild. 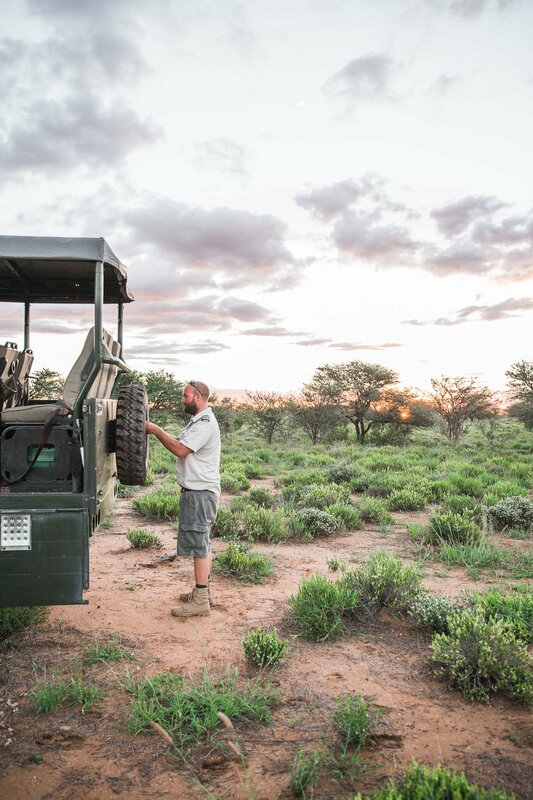 At the Erindi Private Game Reserve we enjoyed daily guided game drives with knowledgeable rangers. The first day we shared the car with other guests and then we had the car to ourselves for the rest of the stay. At Wolwedans we also had our private guide and a car to ourselves. 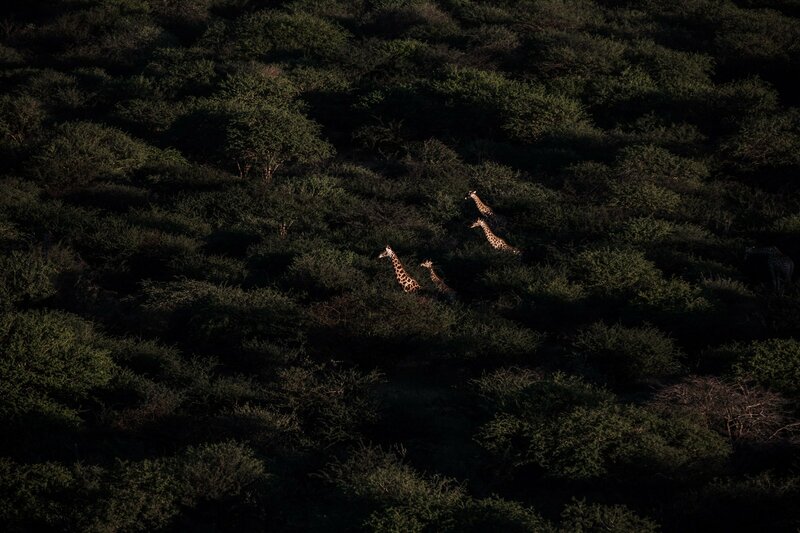 And our last safari brought us to the plains of Etosha, where we drove ourselves. With a knowledgeable guide you won’t only learn about wildlife, but also get to drive off-road to experience nature even closer! Both ways have their Pros and Cons, but we definitely preferred the tours with guides! 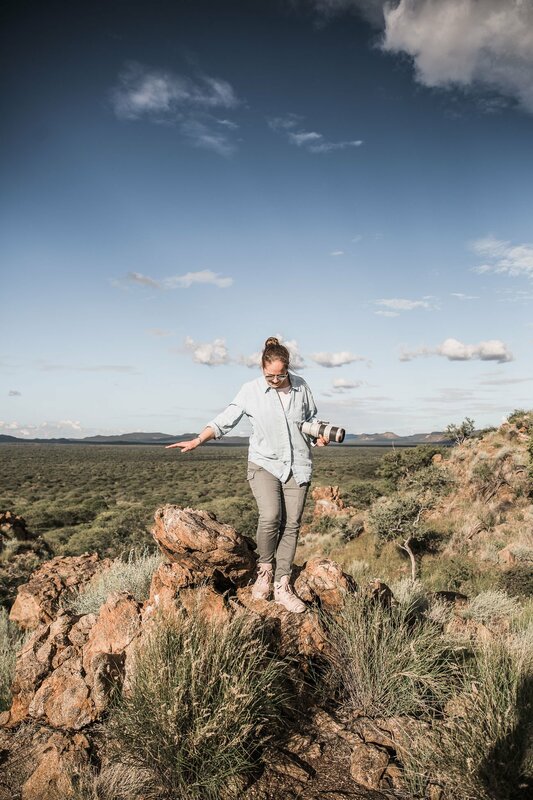 Especially at Erindi it’s really valuable to have a guide with you as this will bring you closer to wildlife as you might have dreamed of. 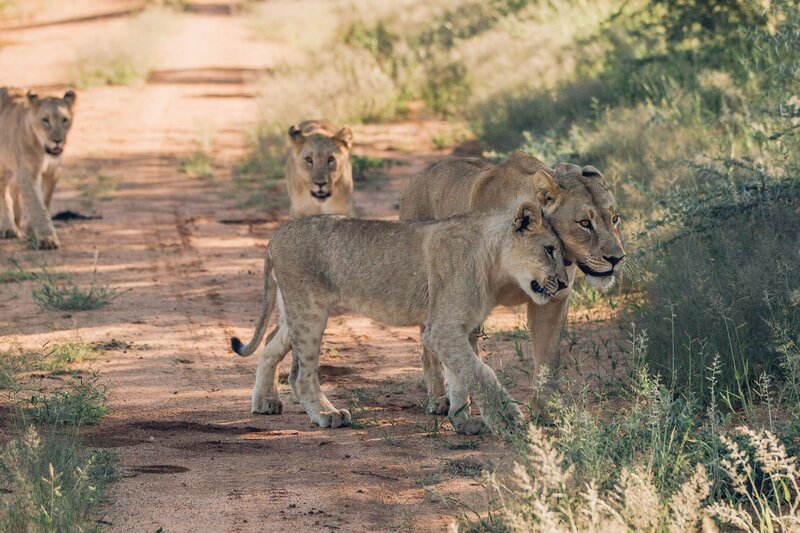 The off-road experience is something, that isn’t possible without a guide and really pays off, when the pack of lions is hiding in the bushes again. 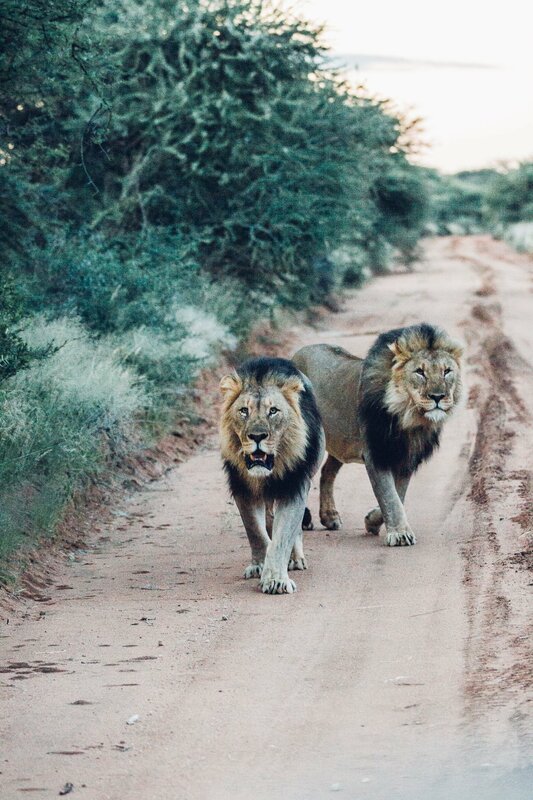 Lions prefer to rest in the shadow most of the day – therefore they are hard to spot without leaving the road. 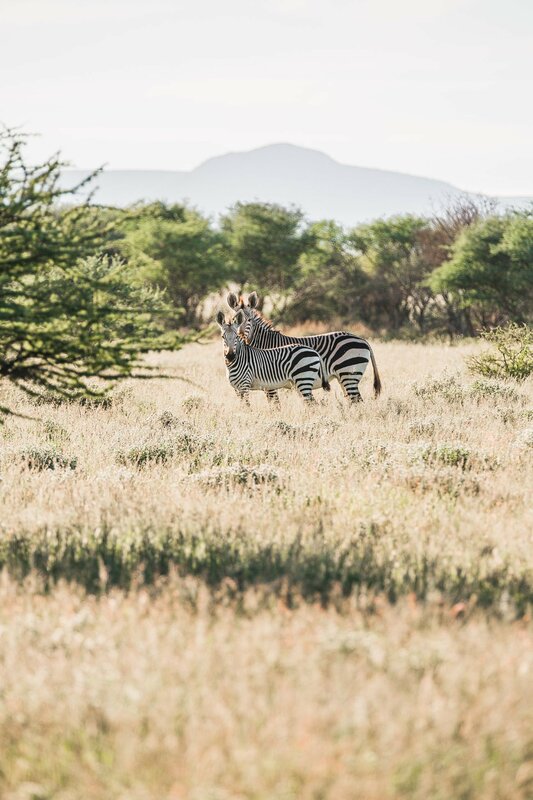 At Etosha we did see huge herds of zebras and antelopes from our car, but those are the animals that are easy to spot. During our self-drive safari we didn’t get to see any lions, leopards or other elusive animals. 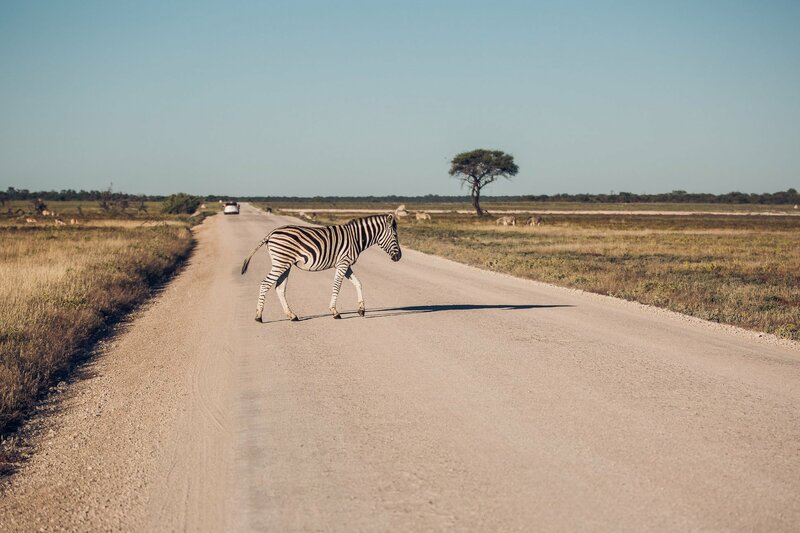 We drove ourselves in Etosha National Park, which resulted in less sightings of elusive animals. 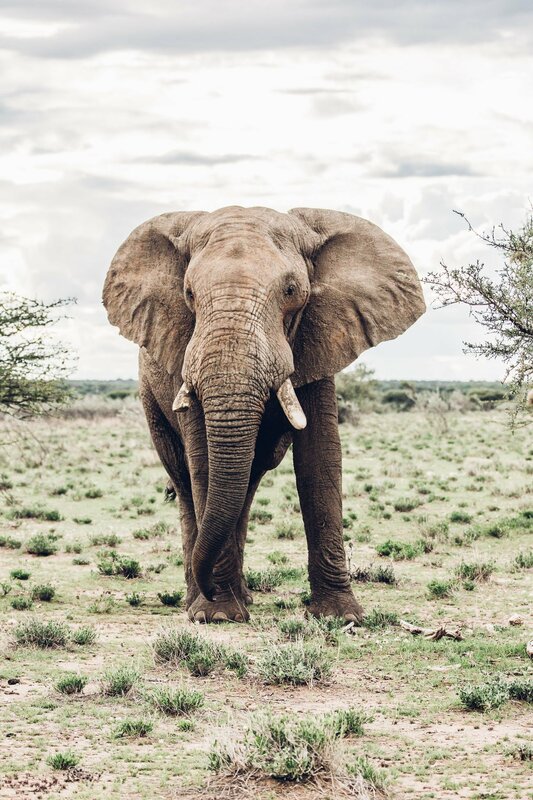 The rangers and guides at the reserves not only have profound skills in tracking and tracing wildlife, they also share their vast knowledge about every species and how you can help to protect them and which conservation efforts are undertaken. This is invaluable and you can’t get this from books! 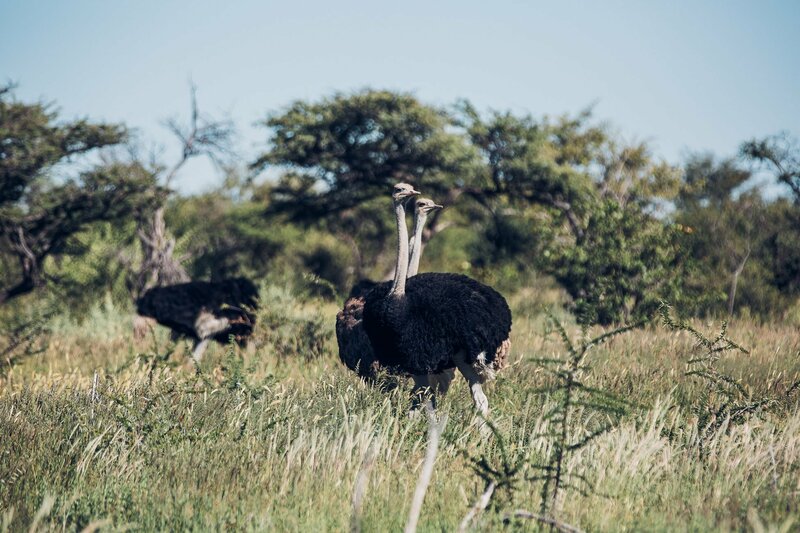 Did you know that ostriches swallow stones to help grinding food in their stomach? 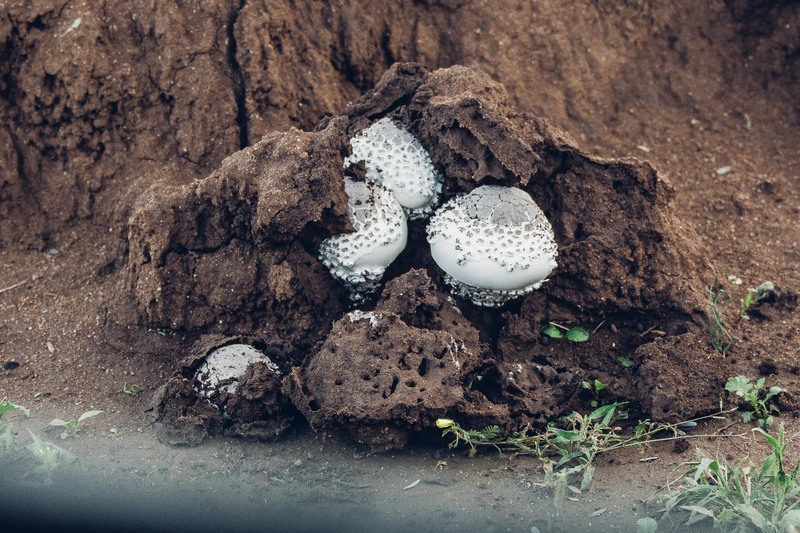 Each adult ostrich is carrying around 1kg in stones at any given time in their belly. 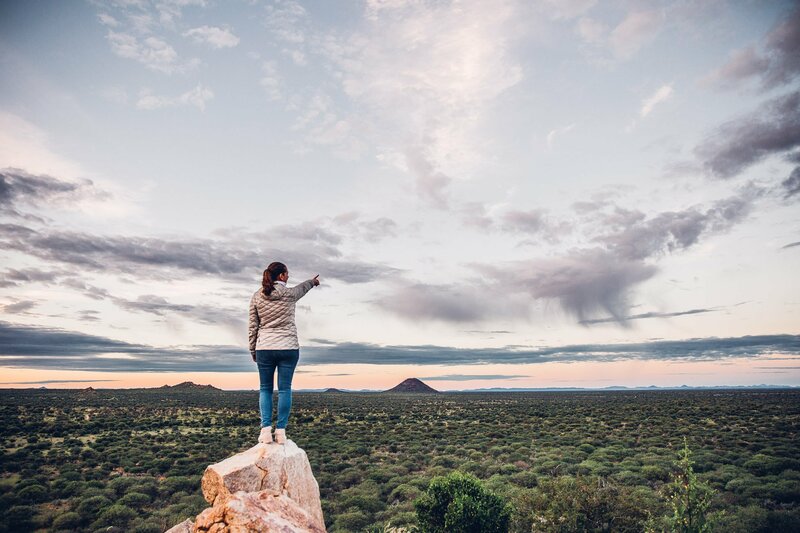 Therefore we would absolutely recommend guided Safaris and would only do self-drive tours if there’s no other way (be it for budget reasons or if tours are booked out). Our guide Warren not only changed flat tyres. 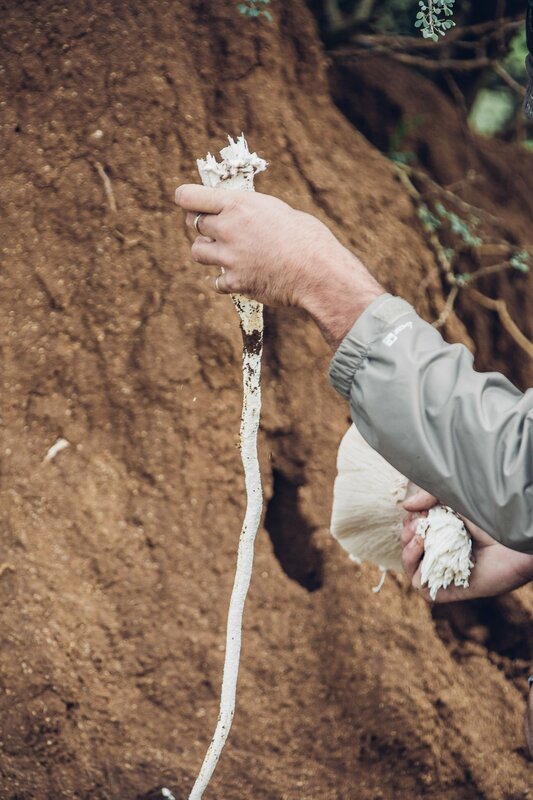 He also showed us the edible Omajowa mushrooms, which grow in termite mounts and taste amazing. 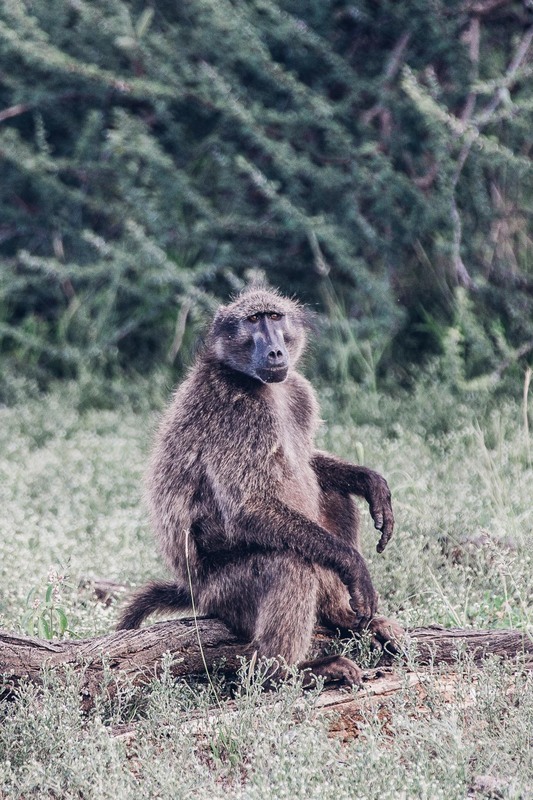 There are a couple of things that I wish I had known before I went on my first Safari. 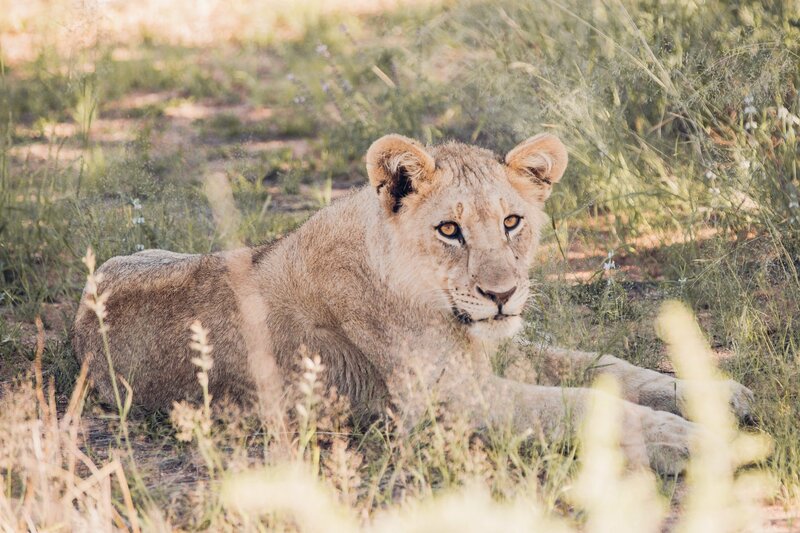 Here’s a list of 5 of the tips, that might help you if you’re planning your first Safari. 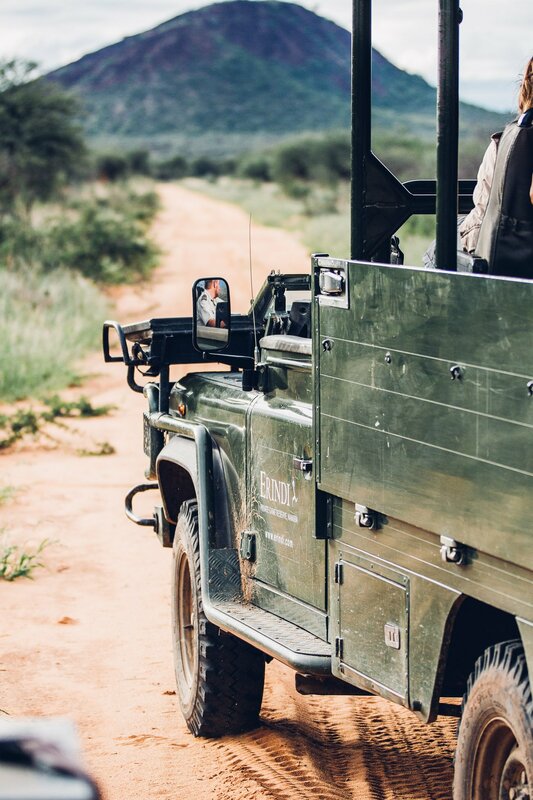 The vehicles at the game drives are open – there’s no windshield and no windows. And you’ll probably drive in the darkness (before sunrise or after sunset), when it does get cold in Namibia. In April temperatures can drop down below 15 degrees Centigrade at night, in July even below 5 degrees. During the day it warms up nicely though, so you’ll be thankful for layering. In the morning I used the blanket to stay warm, during the day I only wore my shirt and at sunset I needed my jacket again. Yes, the animals will also come close – as in very close – to your car. But not all of the time. So for you to be able to get photos a long tele lens is recommended. I packed a 70-200mm lens and a 2x converter (making it a 140-400mm) and I really appreciated it. Now this is the part where I messed up – I only have a tripod, which you can’t use inside a car. But keeping the camera steady while shooting with 400mm is more or less impossible. Every little shake will result in blurry photos. Do invest in a monopod! Getting a sharp photo isn’t easy with a tele lens without any stabilisation! 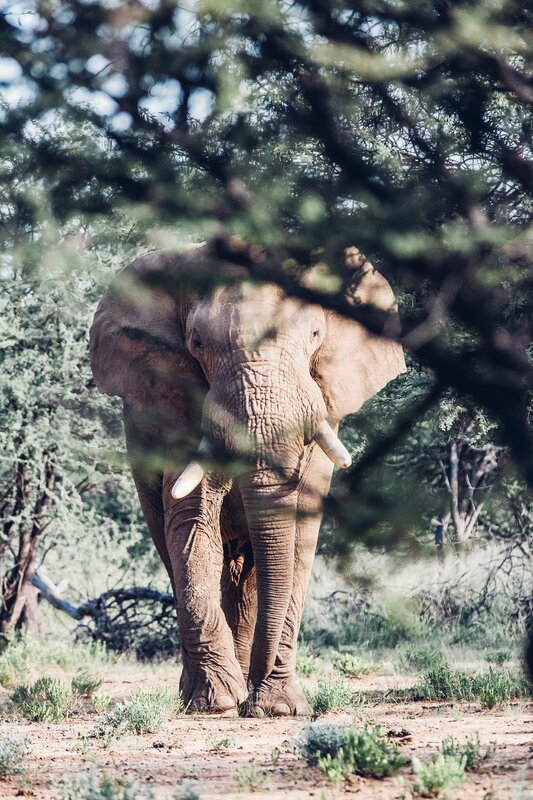 The second encounter was when we took a left at a crossing where a huge male elephant in must was hiding behind a bush. We didn’t see him, so we came onto him way too quickly. 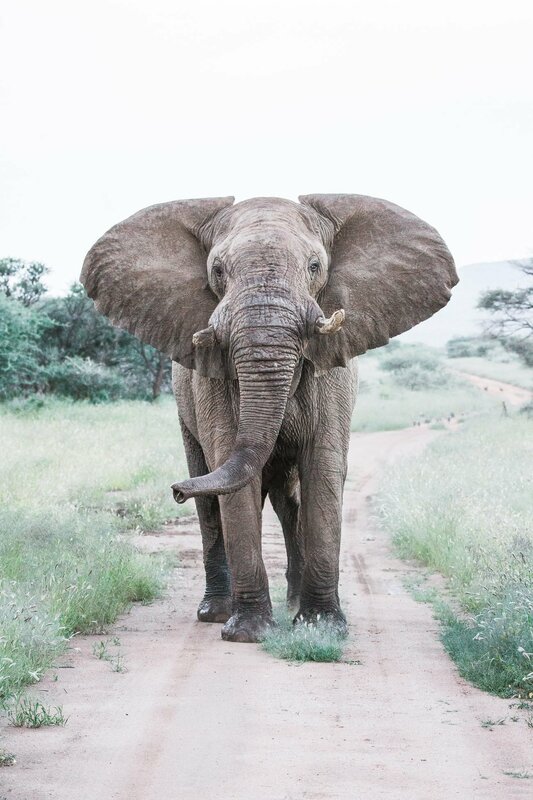 He immediately started flapping his ears, trumpeting and running towards us – as we were like rivals to him. We literally held our breath and turned to complete silence in the car. Our guide Warren just stopped the motor and started talking to the elephant – as in “Easy boy… easy!”. Yes – like talking to a little baby. And it worked – after three attempts of running towards us and then backing up again, we finally were good to go. We did take another road in the end – just to be safe. These are the moments when it’s nice to have an experienced guide at your side! He managed to calm the elephant down. 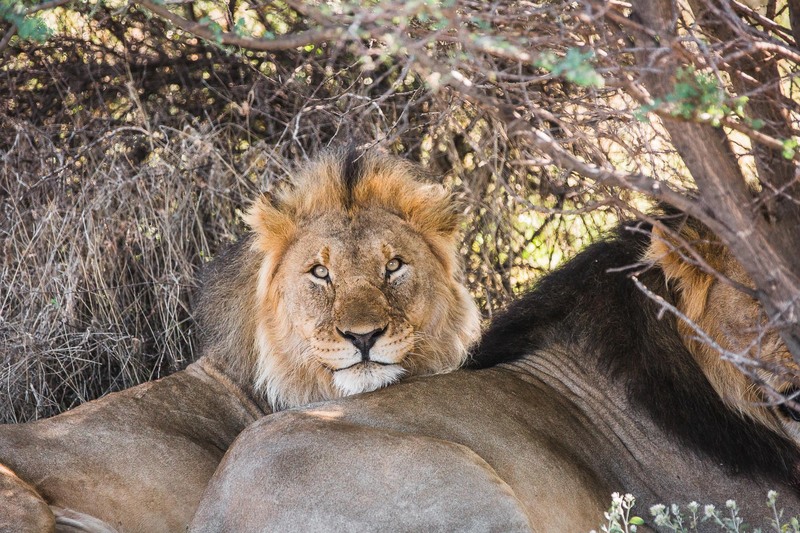 Read all about the location of our first safari – the Erindi Private Game Reserve in Namibia. Unglaublich. Unglaublich schön und atemberaubend. 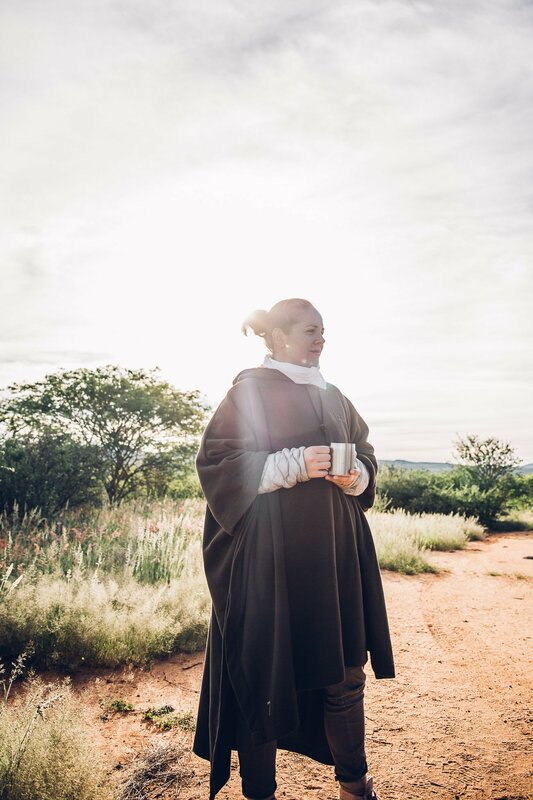 Ich folgte Deinen IG-Stories aus Namibia immer besonders gern – und jetzt die fertigen Bilder noch einmal so zu sehen ist der Wahnsinn. Coastal Battle: Amalfi vs. Sorrento Coast How to choose the right coast?